It's not often that I get excited about seeing "FOR IMMEDIATE RELEASE" in my in-box, but today's announcement that Assault Android Cactus has a set release date just three weeks away put a grin on my face. In this article, we're going to reflect a little on the kind of Early Access experience that this local co-op "bullethell-lite" shooter has provided. For some more detailed thoughts on the game itself, check our previous coverage, in which we interviewed one of the developers and dug deep into what makes AAC unique. 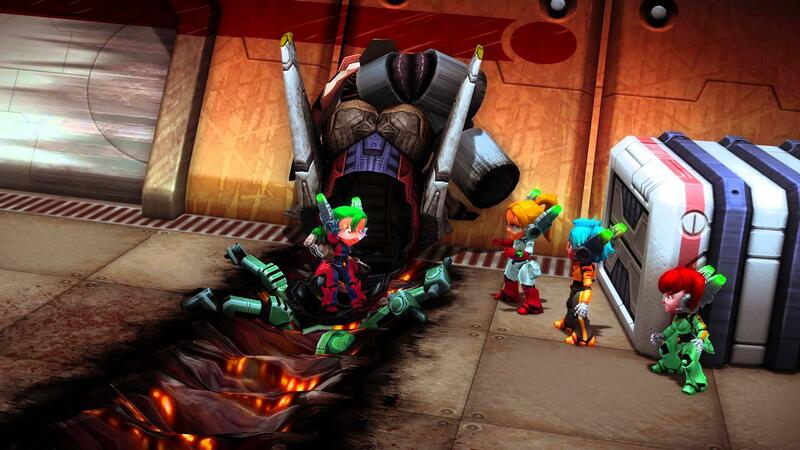 The Early Access version of Assault Android Cactus can be purchased ahead of its September 23rd release date from Steam and Humble Widget on the AAC website, and a playable demo can be found on Steam as well. If it sounds like something you'd enjoy, check it out! It's not my cup of coffee, but judging from the demo I think it is very well executed. Eike It's not my cup of coffee, but judging from the demo I think it is very well executed. If the game doesn't feel like your sort of thing, it's not so relevant, but the demo itself is a bit out of sync with the full game (according to SteamDB, it looks like the demo was last updated 6 months ago). Uh oh, link to Steam broken. And this is totally my cup of tea. Or coffee. I take both. Linas Uh oh, link to Steam broken. And this is totally my cup of tea. Or coffee. I take both. I tried this game a year ago and found it enjoyable but overwhelming. Is there a difficulty slider or "easy mode" in the current version? What is odd is that this genre is called twin stick shooter, but it plays MUCH better with a mouse and keyboard... almost on a FPS kind of level. Great game though, recommended to anyone who likes such arcade games. I very much enjoyed the demo when I played it super long ago. However, the lack of online co-op gives me pause. I'd buy it without hesitation if it had online co-op, but it doesn't and that's borderline deal-breaker for me. tartif I tried this game a year ago and found it enjoyable but overwhelming. Is there a difficulty slider or "easy mode" in the current version? I don't think there is. Looking at the reactions that new players have had, it feels like there's a point at which the game "clicks" for some players and becomes much easier (often along with a realisation about how the battery mechanic works). Julius What is odd is that this genre is called twin stick shooter, but it plays MUCH better with a mouse and keyboard... almost on a FPS kind of level. I've found this too. I find the gamepad so cumbersome (but other players swear by it). I think that the game stands up as a super solid keyboard and mouse experience in spite of it being specifically designed for gamepads speaks volumes about the developers attitudes towards making sure that the game is well rounded. I bought this in early access simply because there was a demo that I enjoyed and was very far along, in my opinion. I've tested it out occasionally, as recently as earlier this week, and it's been good to watch the game grow & improve. Performance from this week was also much better than when I had last tried it, as an added bonus. I do prefer mouse & keyboard, but you can play it with a gamepad. I tried local co-op, but I'll have to wait until the gamepad profiles are updated (they definitely aren't mapped correctly for me!) before that's more feasible. I'll definitely be playing it through again after full release.